I’m writing this as I am cruising along some 9,000-10,000 metres above sea level, somewhere over the vast expanse of the Indian Ocean. Outside the plane window there is only blue – spread and layered into what seems like hundreds of shades of the one single colour. I am awed that one colour is enough to create beauty that stretches from the depths of the ocean, right up to the ends of the sky. Earlier we passed by what I assumed to be the Thailand coast, and I saw many islands dotting the ocean – the weather so clear and sunny that I could even make out the shapes and shades of shallow reefs that surround most of them. Naive amazement aside, I am digressing from the main topic of my post. Which is to say how I am bubbling up inside with excitement, nerve and anticipation as this aircraft gets closer and closer to Kathmandu, Nepal. I’m with my father, and we are both planning to spend a couple of weeks trekking up to Everest Base Camp (abbreviated as EBC) – pretty much the highest point on Everest that an inexperienced hiker can try to get to. 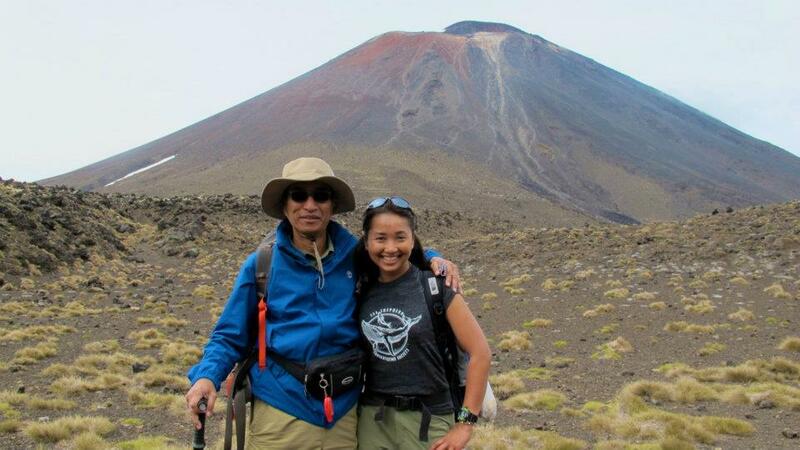 Baba and I on another father-daughter trek we did last year. We completed the 1-day Tongariro Alpine Crossing in December 2011. And thus here we are, beginning another journey listed on our bucket list. 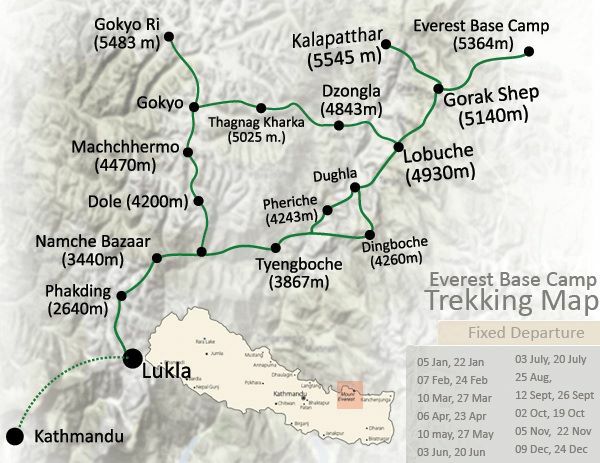 Our planned hiking trail to EBC involves us taking a short local flight in two days’ time from Kathmandu to Lukla. From Lukla, we will begin walking and cover the trail between there and Gokyo. From Gokyo,we’ll take the Chola Pass to get to EBC. The round trip can typically be done in 12-13 days, but Baba and I plan to take it easy and maybe do it in 15 (or more if needed). We thought we would play it safe and give ourselves more time to acclimatize to the altitude, and lessen the likelihood of Accute Mountain Sickness (AMS) hitting us low-altitude-dwelling creatures. I believe we are both fit enough to do the hike, and am pretty much only concerned about how our bodies will adapt to altitude. The highest point we’ve both been to is Low’s Peak of Mount Kinabalu – that’s 4095m above sea level. This was back in 2005, and we didn’t get hit by altitude sickness then. This time around we’ll be ascending much higher so we will have to just wait and see. We pretty much have all the time in the world – Baba is semi-retired and has nothing to rush home for, whereas I’ve just finished this season’s work in Perhentian Island, and am currently temporarily unemployed. This leaves us both with no time commitments. We have an itinerary for our estimated trekking days but will play it by ear – it may go shorter or longer than planned. Only once we’ve completed our circuit will we think about booking our flight ticket home! The graphic itinerary that Baba prepared for our trip, which includes elevation and expected trekking times. He’s also included the highest point we’ve been to so far as a benchmark, which is 4095m when we scaled to the tip of Mount Kinabalu in 2005, as well as longest walk in one day covering 19.4km in 7hours when we did the Tongariro Alpine Crossing in 2011. I’m starting to rush this entry as the plane is on its descent into Nepal, so will wrap this up here. Hopefully I can post this up soon, and keep the updates coming throughout our journey. Wish us luck and well-being on our adventure!